With millions of uber ride taken in a day, uber is indeed at the apex of transport worldwide. As a result uber news is like that of any other great company with a worldwide reputation. User constantly craves better options in pricing, customer support and also the ability to do more. Because of the volume of users, there are questions constantly trending on a topic relating to uber. 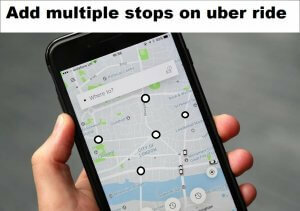 We look at how to How to Add Multiple Stops on Uber ride. scheduling multiple trips can really be confusing for some while others do not even know it is possible. Truth it is possible to add up to two stops to your Uber ride especially in an instance where you need to drop off some. It is wise not to break up the drip to avoid the stress of waiting on the next taxi. Uber ride estimate are based on time and distance as such there is no cost difference. You can also use the uber ride share feature to split the cost between you and a friend, making it easy to share the cost of your ride. Adding multiple stops to your Uber trip before you go or while on the go is easy using the Uber app. Launch the Uber ride app on your smartphone. In the box, enter your destination. Then Add a Stop box will appear. Tap Done at the bottom of your screen to continue booking your trip. tap Confirm at the bottom of the screen to confirm your Uber ride. If you are already on the trip you can also add stop by accessing the homepage on your uber app. Here, you can add, change, or remove a stop using your on-trip screen, which appears as you travel. You don’t have to worry about telling your Uber driver of the addition or removal. The route is automatically updated for them, giving you a smooth trip to your destination. As the battle for supremacy continues between uber and lyft despite the obvious similarities between both companies. We look to bring more feature available on both.